Profiles and bars made of PU, PVC, PES and PE for conveyer technology. We manufacture an extensive range of guide and carrier profiles for conveyor belts, flat belts and toothed belts. 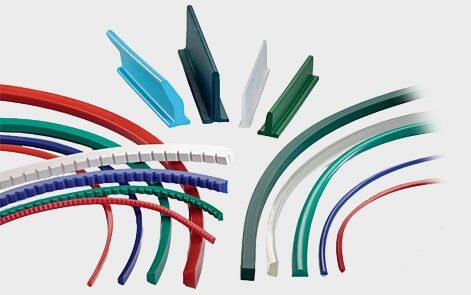 All profiles are available in a wide range of colours. V-ledges can be supplied either smooth or grooved. These bars and profiles are made of high-quality thermoplastic materials and can be easily welded to bands or belts of the same type, or combined by adhesive banding. Our comprehensive product range can supply you exactly with the profile or bar you need for your conveying application. Numerous standard dimensions can be rapidly supplied from stock. Any special profiles and colours can normally be manufactured within 1 – 2 weeks. As a service to our customers, we will also groove PU V-ledges on commission. We are flexible not only regarding the spacing but also the form and depth of the grooves. We can tailor our products to your exact wishes – regardless of whether you intend to use the profile as a guide profile for small deflection radii or as a conveying profile on the top side. Our state-of-the-art production technologies enable us to cut modified dimensions or create brand new profiles from existing profiles. For example, we can create a 4×4 mm V-ledges profile from a 6×4 mm, or a 17×7 mm from a 17×11 mm, or create half-round groove and guide strips simply by dividing round profiles – and all this even for small order quantities and without costly new extrusion tools.